The boundary between the United States and Mexico cuts not only through desert terrain and pristine wilderness, but also indigenous territory. Specifically, the territory of the Tohono O’odham Nation, which is located in both countries. As a result of the Gadsden Purchase, an 1853 U.S.-Mexico land deal, the Tohono O’odham Nation was cut in half. Today, 32,000 of its members live in southern Arizona and another 2,000 live Mexico. The Tohono O’odham Nation shares a 62-mile border with Mexico, the longest international border of any Native American tribe in the United States. Now, its leaders fear that President Trump’s proposed border wall would bring harm to their land and culture. 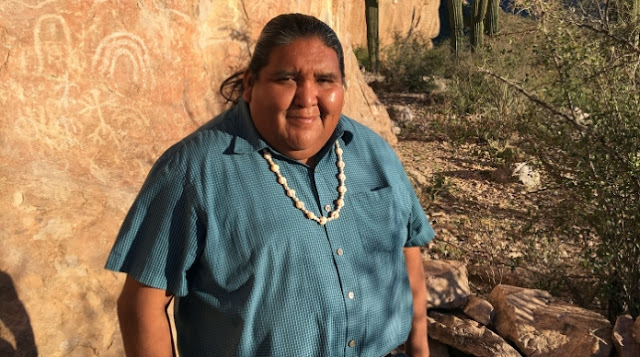 “To build a physical wall along the border will not just divide the land, but also divide our people,” said Verlon Jose, vice chairman of the Tohono O’odham Nation, in a forum held by Representative Raúl M. Grijalva, a Democrat from Arizona, and the House Natural Resources Committee last week. The construction of the wall would destroy sacred sites, as well as archaeological and natural resources, Jose said. It would also prevent people from engaging in pilgrimages to sacred sites on either side of the border. “A wall that does not allow our members reasonable passes back and forth fundamentally interferes with our own right to our religion and our cultural practices,” Jose said. He has good reason to believe a border wall would trample on sacred sites. In 2007, Customs and Border Protection installed vehicle barriers — 6-foot-tall pipes filled with concrete — across O’odham lands to stop cars from crossing the border. Members of the Tohono O’odham Nation said that the construction desecrated an ancient burial ground. This incident would have likely violated the Native American Graves Protection and Repatriation Act, according to a report from the American Civil Liberties Union Border Rights Center. 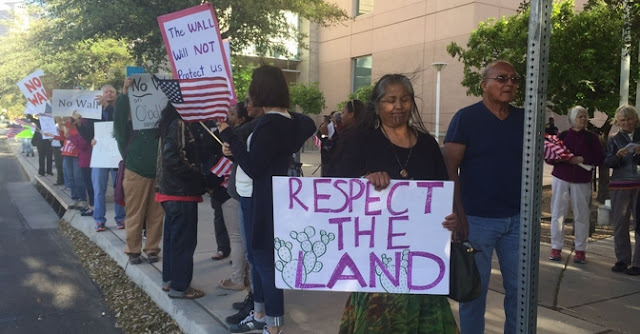 However, that law was nullified under the REAL ID Act of 2005, which allowed the Secretary of Homeland Security to waive any laws and environmental assessments when constructing border walls and barriers — including those that passed through O’odham lands. One particularly large, dry streambed that floods during the monsoon season would be cut in half by the wall, for instance. “They would create a dam that would stop the natural flow of water and prevent water from reaching our reservation,” Jose said. The wall would also disrupt the migration patterns of wildlife and could bring harm to endangered species like the jaguar, an animal sacred to the tribe. “This would be devastating to our resources, plants, animals, soils, and groundwater,” Jose said. The National Congress of American Indians, the largest American Indian and Alaska Native indigenous rights organization, passed a resolution in 2017 opposing the construction of the border wall without the consent of the affected tribes. The Inter Tribal Association of Arizona passed a similar resolution the same year, citing the concerns of the Tohono O’odham Nation and other tribes in southern Arizona that could be impacted by the wall. On top of that, 30 cities and counties in the southern border region have passed resolutions opposing a border wall. Hundreds of property owners along the border have been forced to give up their homes and businesses in eminent domain seizures, said Jennifer Johnson, an advisor at the Southern Border Communities Coalition, in the same forum that Jose spoke at. Responses to "Trump’s border wall would trample on indigenous land and culture"